Grades 9-1… a complex picture. 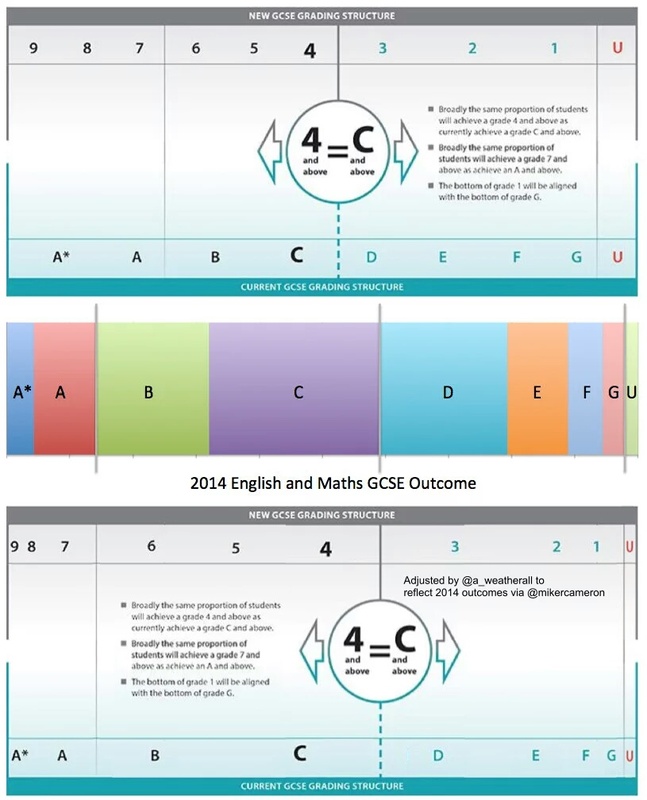 Damian Ainscough has written a blog post about the new GCSE grading system. It’s difficult to produce an accurate representation in a tweet, but I gave it a go. The middle section of this image needs some explanation, meaning that this example is probably too complicated – Damian certainly thought so when I showed him; however I reckon it is worth thinking about. Ofqual state that broadly the same proportion of students will achieve a grade 4 and above as currently achieve a grade C and above. And the same statement is also used for 7+ and grade A (with the top 20% of those students awarded a grade 9). So I used the 2014 data for Maths and English (2015 is similar, but subtly different – I might redo this image with 2015 results). It is important to note that this is the percentage spread of of results nationally, not a guide for grade boundaries. Anyway please pick this apart. 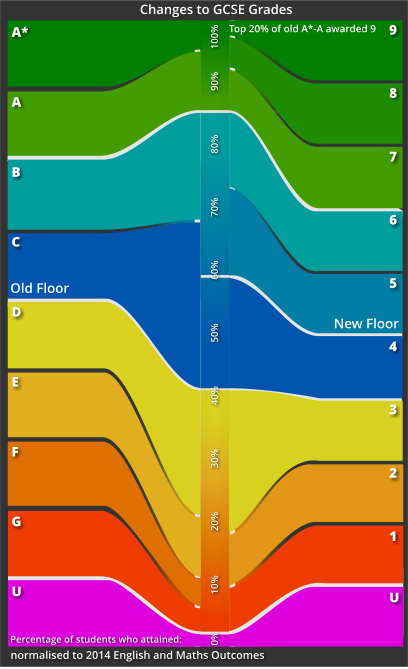 I produced this visualisation partly to see if it was useful and partly to see if I could**. Let me know via twitter or in the comments. *Note: this is a fuzzy generalisation based on English and Maths results from 2014 (via Mike Cameron) – your mileage willvary subject by subject and year on year. 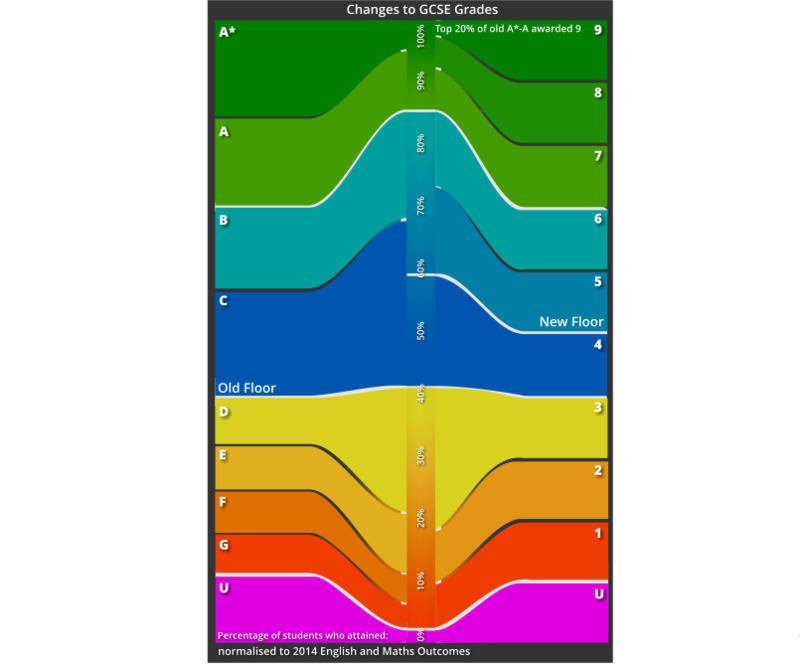 *** I’ve looked into the 2015 and 2014 data and noticed the following: in most subjects roughly 25-30% of students achieve a C so if the bottom of a 5 (the new floor) is going to be the top 3rd of a C, then 17-20% of students will automatically fall through the floor – as the same proportion of students who get a C or above will get a 4 or above. Under the new system up to an extra 1/5 of all students sitting most GCSEs will not get above the floor grade. If we look at the Additional Science results we have a further oddity – the plan is for the top 20% of A/A* to get a 9. 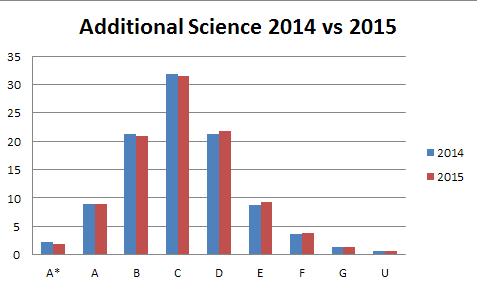 And so the idea is that A* equivalent students are spread between the top of 8 and the 9 grade but if we look at additional science result A-A* in 2015 add up to 10.8% of students – 20% of that is 2.2% but the number of students with A* s were 1.9% of cohort. So in science we might have the odd situation that we’ll get more students with a 9 than we used to get with an A*. 7 and 8 will just split up the A grade. I don’t think that this was the intention. 2 Responses to Grades 9-1… a complex picture. These are really interesting observations, especially the point on A*s/9s. Note that the A*s are currently statistically driven. Worth pointing out a few unknowns. The system you refer to is what has been agreed for English/Maths. Unless I missed it, Ofqual have yet to release plans for other subjects being reformed later, including science. You may be correct in your guess that’ll it’ll be matched to Additional Science outcomes, but equally they could use Core Science, which has a different cohort profile, noticeably at the lower grades. And this is where the use of the word ‘proportion’ becomes problematic, whichever qualification is used to match. The other complexity with science comes from the fact that candidates do a variety of qualifications. In maths the vast vast majority of candidates in the cohort attempt, and get some form of GCSE grade to give something to hang comparable outcomes off. In science the cohort has been split across GCSE-type qualifications and vocational qualifications with completely different grading systems. It will be much more challenging a picture. Back to your A*/9 observation, if it is indeed the same number (and not necessarily proportion) of candidates awarded an 7 as currently are awarded an A then you might see the oddity you mention. But until Ofqual work through and announce how they’re going to manage comparable outcomes on science, I don’t think we’ll know.